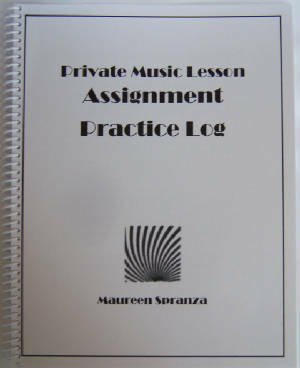 Private Music Lesson Assignment Practice Log Spiral-bound – by Maureen Spranza, PhD. Here's a music practice log book to help students track their practice. Helpful tips provided at the beginning of the book. Makes a great gift to give along with that new music instrument and music lessons! This comprehensive private music lesson log book serves as a valuable tool for students, teachers, and parents to communicate weekly practice sessions. Designed by a private music teacher, the elements of practice are broken into subunits to allow for accurate documentation of music practice and to help students focus on the skills to be practiced. 52 weekly pages provide for a full year of practice documentation. Great for music teachers to hand out to their students or for students to seek clarification for music practice from their teachers. Also great for parents who are homeschooling and teaching music to their children. PayPal and Credit Cards are accepted. $14.50, free shipping.